Should the Bridge to Nowhere get a new name? Action Line suggests a Name The Bridge to Nowhere contest now that the bridge actually goes somehwhere. Whenever a bridge is constructed, the strangest thing happens to elected officials. They get all giddy about a new addition to the civic family. They promise to take good care of the bridge. They sign some papers. And then they give the bridge a new name. It’s as if bridges are rescue dogs. So maybe we ought to start there. We could call the Bridge to Nowhere something like Trixie, Boots or Buddy. No longer a lonely heart, it will be our pet bridge. But many people have a pet peeve about naming infrastructure. On one hand, there are cultural purists who insist upon bestowing Very Important Official Names to keep local history alive. Apparently, the best way to keep local history alive is to name stuff after dead people from somewhere else. Officials want you to refer to this span as the Rivera Bridge, in honor of Spanish explorer Juan Maria de Rivera. In 1765, the Rivera Party traveled from Santa Fe into these parts looking for gold. The party crossed the Rio de las Animas in the general vicinity of the bridge, wandered around the region and went home. Which brings up an interesting question. Why do we call it a “party,” when expeditions generally involve suffering, hunger, sickness, misery and death? Please don’t invite Action Line to such a party. Especially if your name is Donner. The other infrastructure-naming strategy is to hold a contest. Anytime you seek public input, you run the risk of getting utterly bizarre results. Just look to the recent presidential election. Back in 1992, the town of Avon and seven funding partners rallied to build a 50-yard, four-lane bridge over the Eagle River. There was no unanimous choice for its name, so the task was given to the Avon Merchants Association, which then held a contest. “The winning entry was an average, ordinary name (just like the bridge) – Bob,” according to Avon’s website. A year later, in 1993, Steamboat Springs replaced the old “Stockbridge,” so named because cowboys used it to drive cattle across the Yampa River. So the Steamboat Springs City Council organized a contest, stipulating that the name had to have cultural or historic significance to the area. Just for fun, someone entered “James Brown Soul Center of the Universe Bridge.” And just for fun, the name was included along with five “real” finalist suggestions. The brouhaha was a perfect opportunity for Steamboat’s KFMU radio station to create a brilliant promotion that whipped the town into a Godfather of Soul frenzy that attracted worldwide attention. During a subsequent do-over election marked by blatant ballot stuffing, the James Brown Soul Center of the Universe Bridge won again. Later that autumn, James Brown, wearing an electric blue jumpsuit, flew in to attend the dedication. Papa’s got a brand new bridge, and the Hardest Working Man in Show Business hosted a benefit concert. What does that have to do with Durango? The general manager of Steamboat’s KFMU was none other than our good friend Ward Holmes, now regional manager for Four Corners Broadcasting (KIQX, KRSJ, KIUP and KKDC). For the full story of the James Brown Soul Center of the University Bridge, check out the hysterical story at http://tinyurl.com/bridge-soul. 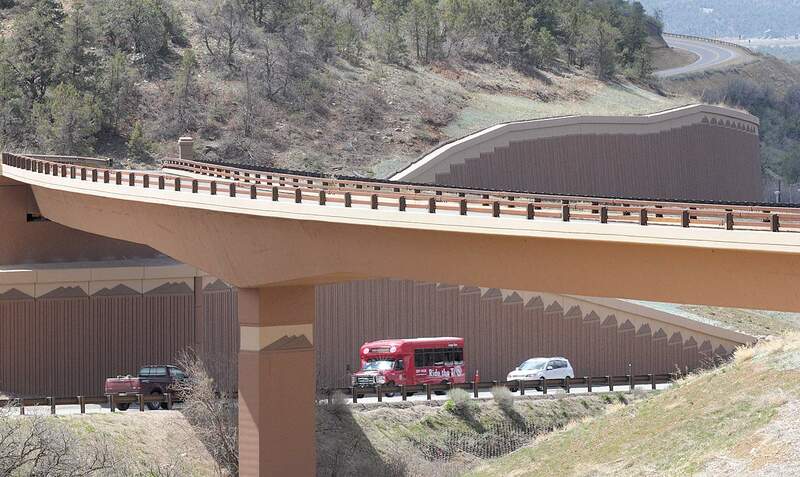 So La Plata County simply must organize a Name The Bridge to Nowhere contest. It’s an especially keen idea considering Snowdown is just around the corner. Email questions to actionline@durangoherald.com or mail them to Action Line, The Durango Herald, 1275 Main Ave., Durango, CO 81301. You can ask for anonymity if you just please don’t suggest The Kim Kardashian and Kanye West Together Forever Bridge.